An MPD is a Metropolitan Park District, one type of “junior taxing district” funded by property tax. Changes to state law in 2002 allowed unincorporated areas like Kingston to form an MPD. The Village Green Foundation is the not-for-profit organization that has been raising funds for a replacement community center at the Village Green Community Park in Kingston. The Village Green Foundation board helped to create the MPD because it was essential for operations and maintenance of the replacement building. There are other sources of capital funds – state and federal grants, state and federal appropriations, private foundation grants, individual and corporate donations – but few sources of operating money. These days, anyone providing funds for facilities requires that the applicant show they have the resources to maintain the facility. Here are operating funds sources not available for this project. Kitsap County Parks budget has shrunk. Less and less is being spent in Kingston. Kingston has no other taxing authority, as an unincorporated area. The Port of Kingston does have taxing authority, but its mission is maintenance and operation of the waterfront. Rents and building-use fees cannot alone support the operation and maintenance of the new facility, or it will not be affordable for those who need to use its services and amenities. The MPD is authorized to levy up to 75 cents per thousand dollars of assessed valuation. But that’s not what we want: We want an MPD to be a source of revenue to make the building fees and rentals affordable, and by our calculation that would take up to 15 cents per thousand. For the average home value in Kingston, that would amount to $50 per year. Users of the present facility were the population targeted for inclusion in the Village Green MPD. People using the community center, library, and senior center live as far away as Hansville, Indianola, and Eglon. However, those communities have multi-use facilities close at hand, and Hansville and Eglon have easy access to the Little Boston library. 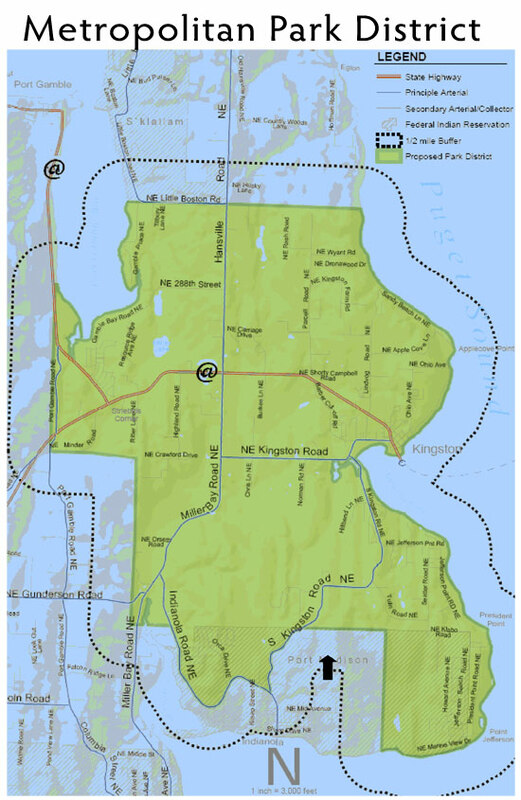 Our district is limited to most of the Kingston zip code except for Eglon, plus Miller Bay Estates, which actually has a Poulsbo zip code. Our thinking about Miller Bay estates was guided by the expanded service reach of the replacement facility. An important part of the new building’s features will be a permanent home for our Boys & Girls Club, including the multi-purpose space that will be usable by all community members during non-Boys & Girls Club hours. Kids who go to Kingston schools are likely users of our Boys & Girls Club. We plan to use the Kingston bus routes to help transport kids to the Boys & Girls Club after school.